The world of racing is nothing if not fast-paced. 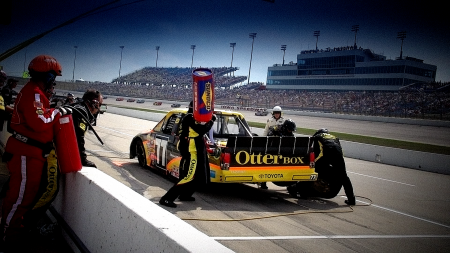 For Germàn Quiroga and the Red Horse Racing team, that means spending a majority of the NASCAR Camping World Truck Series season on the road, tearing up the asphalt at tracks around the country and rushing back to their shop to prepare for the next race. To stay connected with the team on race day and with their families every other day, the driver and his team rely on their mobile technology. To keep that technology working in the dusty, greasy, rough-andtumble chaos, they trust OtterBox. Quiroga broke into racing at the age of 14 in his hometown of Mexico City. His career has taken him from an entry-level series to stock cars to formula racing and back again before deciding to stick with the NASCAR Mexico Series where he became a three-time champion. While the series remained challenging, with new struggles each race weekend, Quiroga was not satisfied to rest on his laurels. That job doesn’t start and stop at the racetrack. DeLoach believes that the races are actually won at the shop as much as anywhere and mobile technology has increasingly become a part of this intricate journey to the winner’s circle. The Red Horse Racing team consists of more than 50 highly skilled individuals — three drivers, road crews, pit crews, fabricators and more. They are all a piece of the complicated mechanism that results in a winning team, and they are tied together, on and off the track, by mobile technology. For Katey Hawbaker, director of marketing and media relations for Red Horse Racing, the job requires constant connectivity. Solely responsible for the team’s web presence, media relations for three drivers and a litany of race day tasks, Hawbaker relies on her Apple iPhone. In addition to keeping track of the media and public appearance schedules for three drivers, she is consistently updating the fans. Though his focus is dialed in at the track, Quiroga relies heavily on mobile technology both personally and professionally when he’s away from it. He keeps up his personal webpage, responds to fans, tracks his physical training regime and is able to stay closely connected to his family back in Mexico using his mobile devices. At odds with the level of concentration and precision Quiroga exhibits on the racetrack, is his seemingly haphazard approach to keeping connected. That’s where OtterBox comes in.